Face the dragon encounter and bring the end of the dragon era in this dragon quest and one of the most epic dragon games - Dragon Shooter 3D! The dragon war is about to happen, they have found your home village and about to burn it down! Don't let that happen and like real dovakin hero you have the power to save your village! 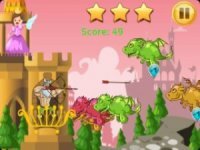 Become a dragon warrior and distinguish yourself by becoming a famous dragon slayer in this Dragon Shooter 3D game! HOW TO PLAY Dragon Shooter 3D: just aim and shoot by tapping the screen. Dragon Shooter 3D Features: - Cool 3D graphics - Become a legendary dragon slayer - Simple interface - Addicting gameplay - Try it now while it's still free Be a professional dragon hunter and don't let the dragon encounter happen in Dragon Shooter 3D game!